The green addition here is a kale pesto, which is very simple to whip up while waiting for the rice to cook. It’s easiest in a food processor, but if (like me) you only have a blender, we can make it work too. I didn’t use my mason jar blender trick only because we’re going high-capacity with this one – we’re packing a huge volume of greens into this sauce! The recipe yields more pesto than you’ll need for the rice, which is a good thing because you’ll want to spoon it over everything in your path. 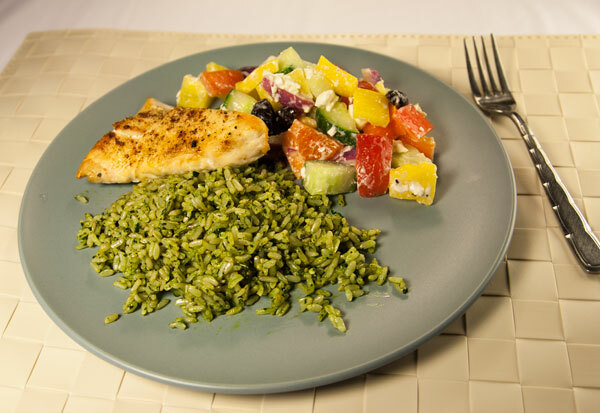 Use this green rice anywhere you normally include rice in your cooking, like under a stir fry, folded into a burrito, or alongside roasted chicken or grilled fish. As for the extra pesto, try it on sandwiches, pizza, eggs, toast… the sky’s the limit. It’s super versatile just like basil pesto, except even more so because kale is cold-hardy enough to stick with us through the winter months. Last night I served it with simple broiled chicken breasts, and an old favorite – Smitten Kitchen’s Mediterranean pepper salad (so, so good). 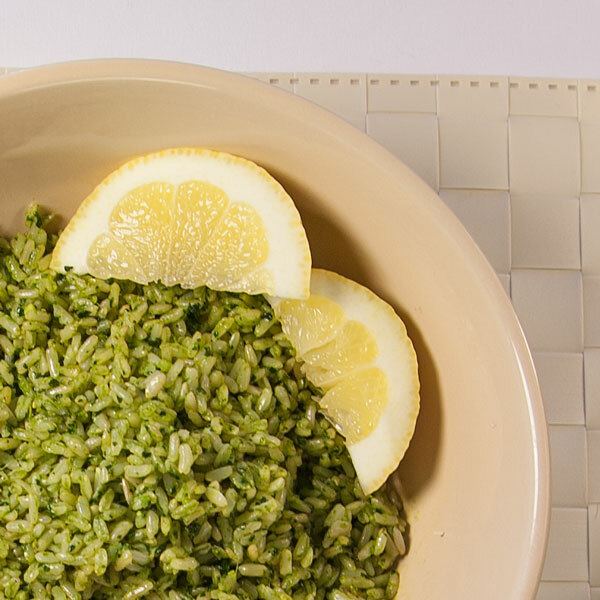 For me, an extra squeeze of lemon juice over the rice before serving is 100% essential – it makes the whole thing taste lighter and brighter, and creates a perfect balance with the earthy greens. Cook the brown rice according to package instructions or with your preferred method. In a food processor or blender, combine the raw kale, garlic, walnuts and lemon juice. Blend these ingredients as smooth as possible. If using a blender, stop periodically to stir the mixture and push the larger pieces down toward the blades (it's okay if you aren't able to achieve a uniform texture; it will come together in the next step). Continue to blend while gradually adding the olive oil, until the pesto is smooth. 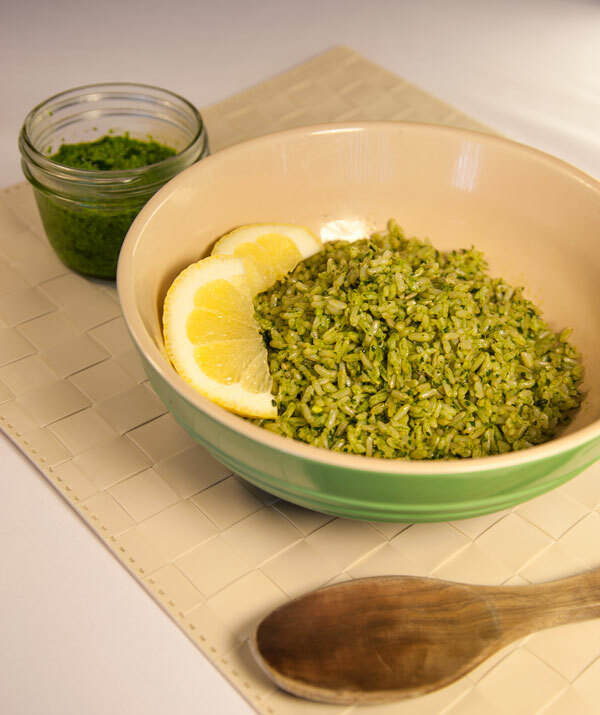 When the rice is done, fluff it with a fork and fold in 1/4 cup of the pesto. 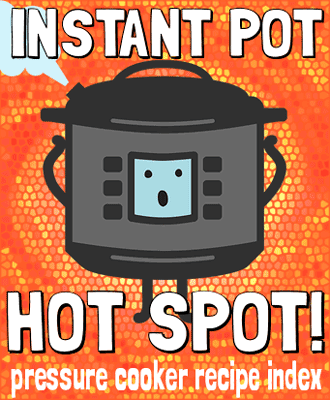 Serve hot, topped with a generous squeeze of lemon juice. Store the remainder of the pesto in an airtight jar in the refrigerator for about a week, or in the freezer for up to 8 months.